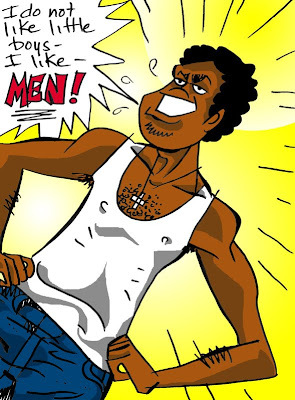 This is just a small preview of the upcoming issue of Black Gay Boy Fantasy, which seems to be getting longer and longer. It's almost 50 pages!!! It's becoming an extravaganza!!!! Sorry, folks. It's not in color (and sorry it's taking so long). I just did this to distract myself. So good to hear from you baby! I hope it is as big a success as you want it to be honey.. Always good to hear from you!!! But, it's coming. I swear! The story just keeps growing. I didn't keep track of the pages because I just wanted to tell the story. Now, I'm filling in gaps. It may be about/over 50 pages!! !